← Dominos, Butterflies, and You-Make a Difference! The Dix clan embarked upon an urban Indianapolis adventure on a beautiful late August, Saturday afternoon. We ended up at the Indianapolis Museum of Art. Little did I realize that I had a couple of stowaways with us. My inner Siamese twins, Judge and Critic, had tagged along for the ride. The IMA has invested a sizeable amount of money into a new outdoor experience called 100 Acres: The Virginia B. Fairbanks Art & Nature Park. http://www.imamuseum.org/100acres. We had heard about the park, but had not really researched it, so we didn’t know what to expect when we headed off into the 100 acre woods. We walked right past two separate wedding settings being constructed. One was complete with elegantly dressed grandparents of the soon-to-be newlyweds, enjoying the shade of an ancient tree. They sat like statues in alabaster folding chairs and stared at the formal gardens, which were the site of the upcoming vow exchange. Perhaps they were reminiscing of their first chaste public kiss that would seal their own ’til death do us part commitment to each other. I’ll never know, because at that moment, I began to hear from Judge and Critic. We entered the 100 Acre woods anticipating exciting glimpses of wild art in its natural setting. I think my young girls were hoping for climbable art. We crossed the red bridge that spans the canal and entered under a green canopy of trees. “Where’s all the art?” asked a bored Critic. “All I see is woods.” Judge quickly agreed and noted that it seemed to be just a hike and not an art exhibit. This inner whining was in full swing as we walked through various trees, vines and undergrowth of all shapes, shades and hues that lined the well maintained crushed stone walkways. Shadows flashed on the ground from a diffused sun occasionally, as the breeze parted the treetops briefly. Critic, preoccupied with trying to spot poison ivy and snakes, failed to notice the trees’ performance art. When we finally found the man-made art on display, I could not really get a good look, because Critic and Judge blocked my view. I could plainly hear them sniping between themselves, “Is this a park bench or a piece of art?” “How is a floating igloo called art?” Their negative commentary grew louder the more tired, hot and thirsty I became. Finally, we all decided to give up on the 100 Acres and spend some time in the air conditioned comfort of the main museum. After partaking in cold refreshments, (that were somewhat unsurprising a bit pricy per Judge and Critic), we wanted to use the few remaining moments before the museum’s closing to see some art. We ventured to the third floor and our 9-year-old raced to see Jeppe Hein’s Distance. She raced to follow a white plastic ball that released as we entered this operational sculpture. It rolled on a steel rollercoaster track through walls and into different rooms. She laughed and giggled and pointed and ran to follow her ball on its journey. I tried to keep up with her, but Judge and Critic were doing their best to hold me back. “Looks like an overgrown bowling ball return!” shouted Critic to the snarky amusement of Judge. Judge was also on high alert, suspecting that the young art lover in our family might at any moment, want to scratch and sniff and feel her way through an exhibit. As closing time rapidly approached we downwardly escalated to the exit. As we were riding down, one of the brides and several of her attendants were riding up. She was aglow in her angelic white gown. Critic and Judge sniffed an unprintable comment that made it challenging to return her broad smile. Once in our car, we headed for a sushi dinner. While in-route, each family member recounted her favorite parts of our day together. My artist wife, my pre-teen and my fourth-grader all had attended a better exhibit than apparently I had attended. I couldn’t really hear them over Judge’s and Critic’s heated discussion of what passes for art these days. That’s when I remembered that I had the power to gag both Judge and Critic at the speed of thought. I pressed my mental mute button and silenced them. As the girls continued on, I flashed through the trip to try to salvage as much of the experience as I could for prosperity. I remembered my youngest taking my hand as we walked in the 100 acres. How small and warm her still tiny hand felt in mine. One day hopefully, she will be a beautiful bride on her perfect August afternoon and I will be walking her down the aisle to turn over her care to her soon-to-be husband. 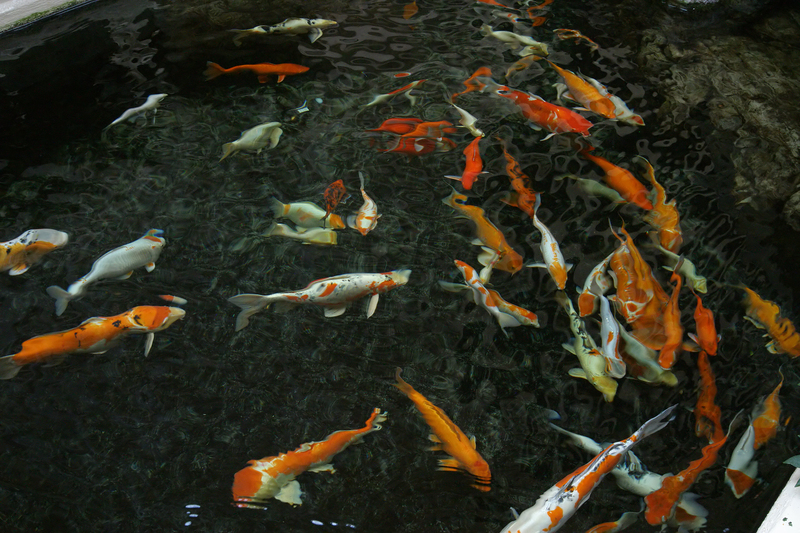 I reflected on the small koi pond where we had paused to sit on the rocks and watch as the bright orange koi cast jet black shadows on the pond’s floor, creating two schools of koi to consider. Lastly, I tried to recapture the feeling of vicarious wonder as both my children met giant-sized art for the first time. They were free from judgement and criticism and were simply alive in a special moment. They experienced the art in emotional ways that I had chosen to no longer allow, in the name of refinement and education. Fortunately, I found and stored many marvelous images of our family expedition in my museum of memories. I chose to edit out Judge’s and Critic’s presence. Next time, I am going to do my very best to remember to leave Judge and Critic at home. They really are a downer and are no-fun to hang out with. I think I’ll bring Curiosity and Appreciation along instead. What are you missing out on while you are so busy judging and criticizing? Is there a better way to live? What do you need to do to reclaim your lost sense of wonder? Is it time to experience life for life’s sake and not gripe and complain about what it is not? All too often in life, we tend to reject a bouquet of wild flowers because we are fond of roses. We miss enjoying a perfectly above average “B+” experience because it did lot live up to our “A+” expectation. Maybe we would be happier if we remembered that “C” answers are still satisfactory. P.S. The IMA is wonderful and well worth the price of admission…FREE! Please visit and support the arts. Author, Board Certified Executive Business Coach, Trainer, Reiss Motivation Profile Master and Private Pilot. Expertise in motivational intelligence, leadership development, strengths, management, coaching, and change management. Available for keynote addresses. 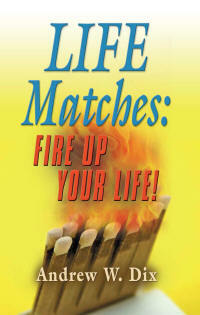 © Andrew W. Dix and Life Matches: Fire Up Your Life! Blog, 2010. Unauthorized use and/or duplication of this material without express and written permission from this blog’s author and/or owner is strictly prohibited. Excerpts and links may be used, provided that full and clear credit is given to Andrew W. Dix and Life Matches: Fire Up Your Life! Blog with appropriate and specific direction to the original content.